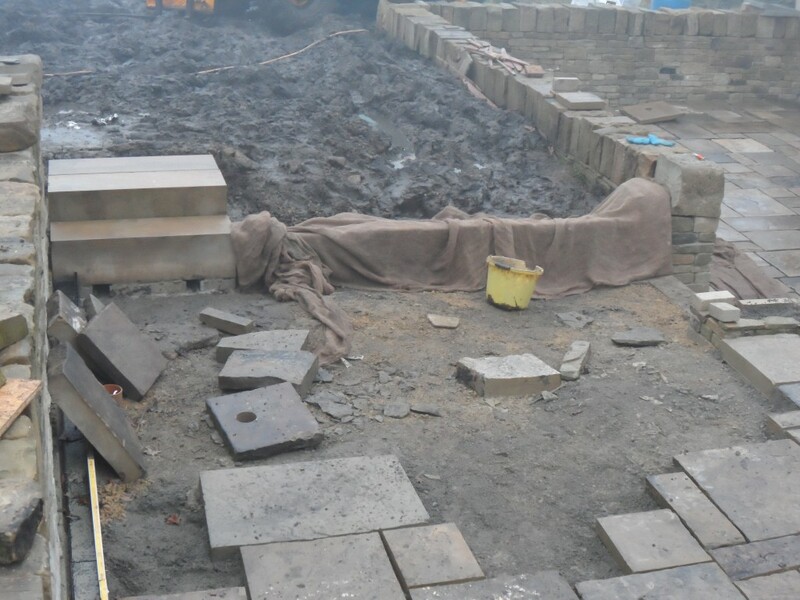 At last all of the ashlar is in place and all of the flagstones are down. There is still pointing to do, but that is going to have to wait a bit until the weather improves – it can’t be too wet or too cold when doing the pointing. 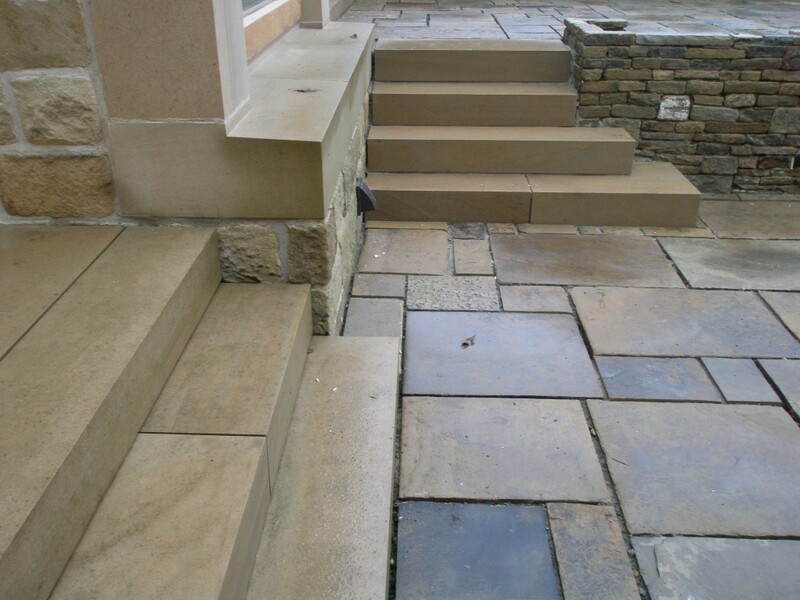 Three sets of steps and 160 square meters of flagstones. 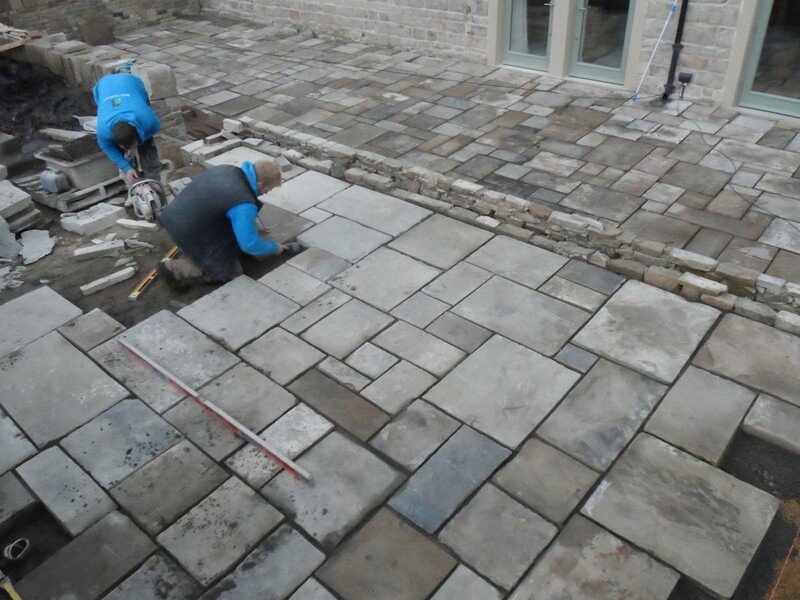 The pointing is still to be done between the flagstones, but we are going to have to wait for some better weather. The lights are still to be installed (although the holes and wiring have been put in place). We still have to point the flagstones. 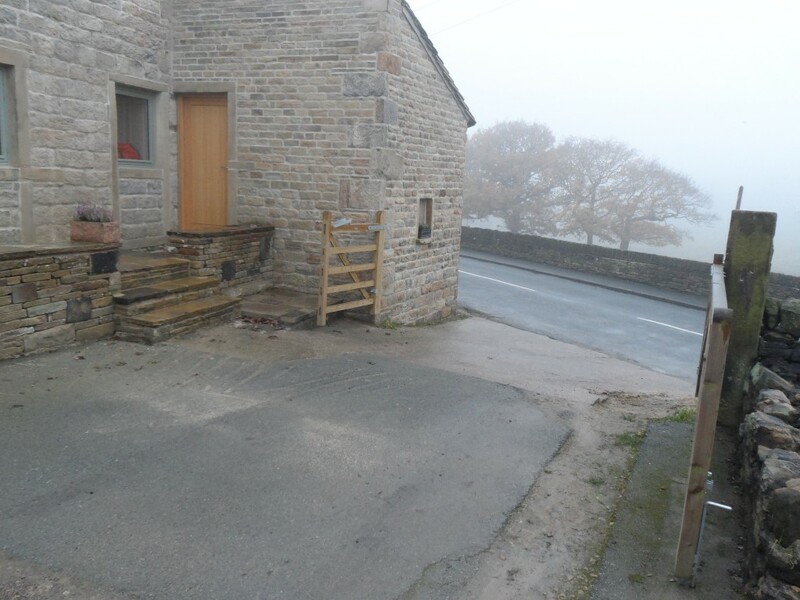 This will be done using lime pointing (just like the main house), however, this is going to have to wait for better weather. The ashlar slabs have been installed outside the master bedroom. We haven’t moved in here yet, but in the summer it will be possible to step out into the sunken garden from the bedroom. The floor inside is the same level as the ashlar slabs outside. 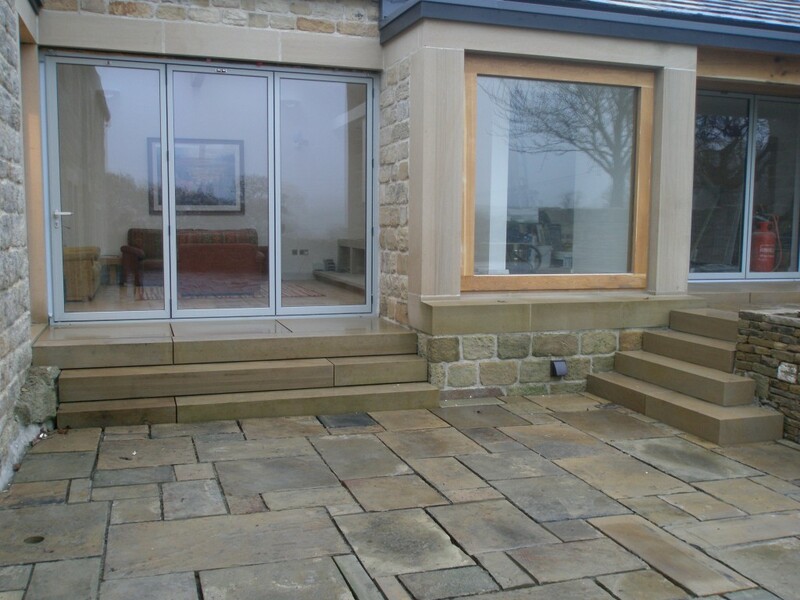 The new steps from the lounge and a step of steps to the upper terrace. It would have been easy just to have put 1200mm wide steps in here, but it looks so much better with the bottom steps extended outwards. The reclaimed walls could do with being pressure washed to remove some of the old paint and dirt but they contrast with the new stone steps. The final stone steps are in! There was major relief today when the final set of stone steps were installed in the garden. Installing these steps has been a monumental effort on behalf of Paddy and Jonny. Most of the stones are well over safe working loads for two men, so that have had to use the ingenuity to get these in without any major incidents. 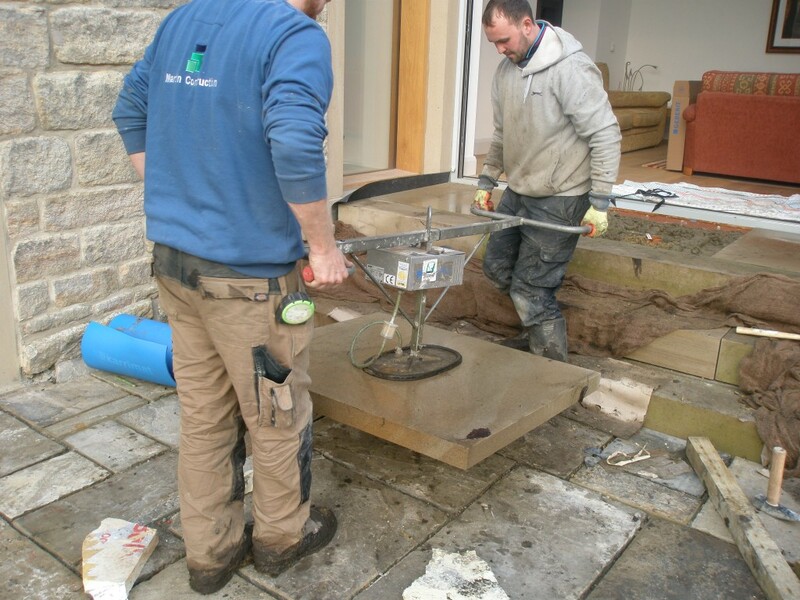 Once the step is roughly in position (but still resting on the slabs of insulation), the stone step is lifted up (the sides are protected by some thin blue foam) and the insulation removed (very quickly). 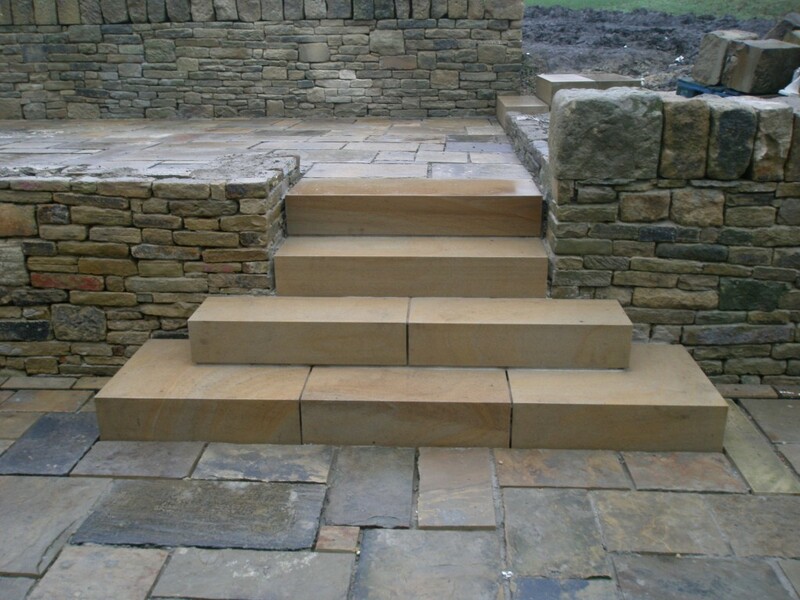 If it all works out properly, the stone step ends up in the right spot! Pulling out the installation. It looks a bit like a sequence from a game show, but you need to be quick to make sure your fingers aren’t underneath the stone step when it is lowered! Once the step is in position, the blue foam is pulled out. This protects the sides of the step as it is lowered into position. 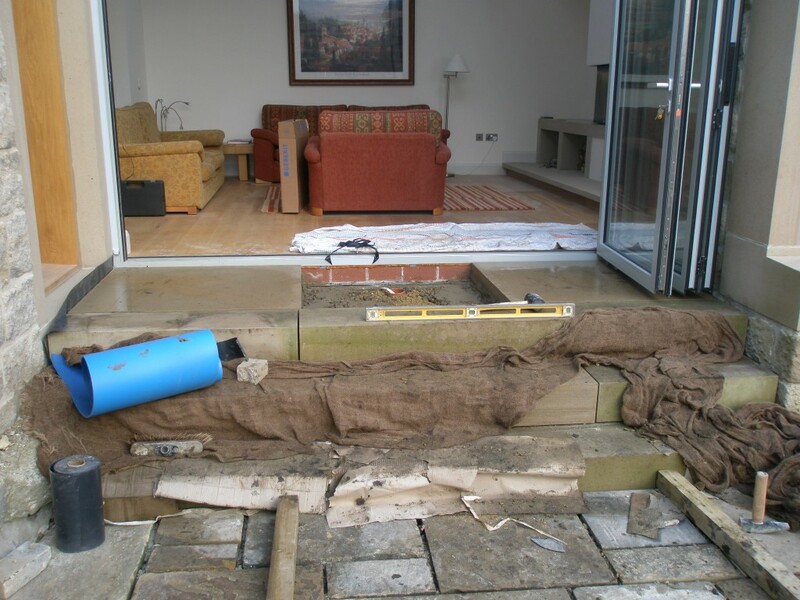 The flagstones will cover the bottom half of the first step which is why it is a taller than the other steps – half of it will be buried. After 5 weeks of waiting, the ashlar finally arrived for the stone steps in the sunken garden. We need to get the steps into position so that we can flag up against them and get the flagging finished. 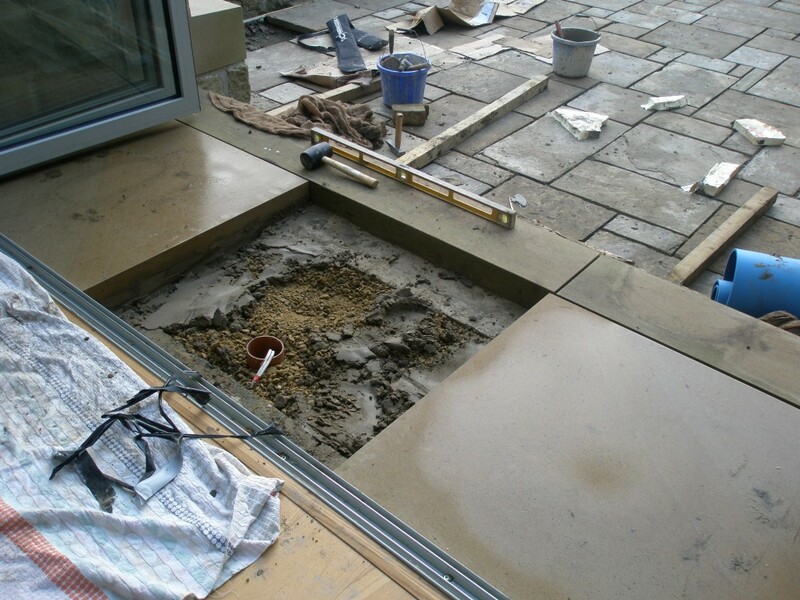 We are installing the three large ashlar slabs that are laid in front of the bi-folding doors to the lounge. This makes the top step wide enough so that the doors can be opened without overhanging the top step. There are lights to be installed in each of these three slabs (you can see the wiring where the middle slab is still to be laid. These slabs are being moved into position using a powerful suction device. Using a powerful suction device, the final ashlar slab is lifted into position. These slabs are very heavy and this photo doesn’t really convey exactly how difficult this task was. There was relief all round once it was in position. These steps still need to be pointed, but the steps are pretty much complete. They also need to be pressure washed to get the “green” of them – they have been covered for the past few weeks to protect them. 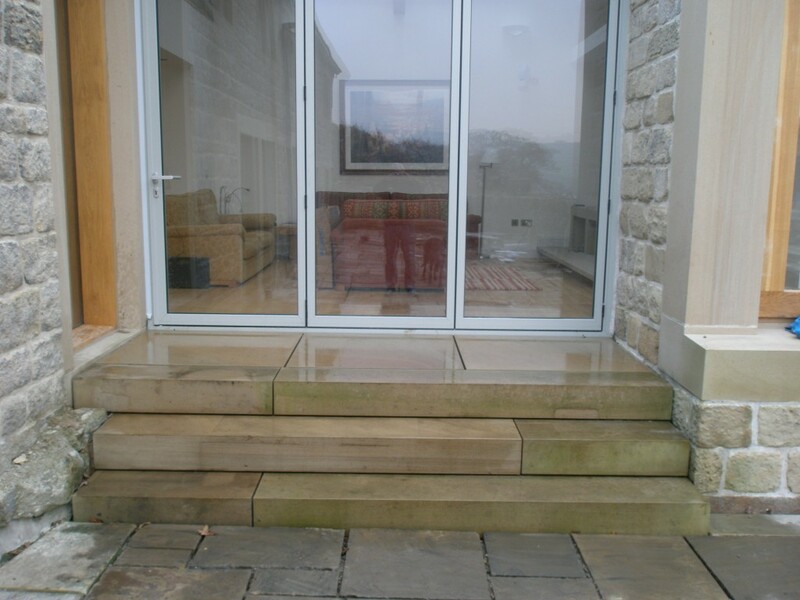 Once cleaned, the steps will match the new slabs installed in front of the doors. The weather this week hasn’t been great. And the weather today has been great either. The fog never really lifted at all. However, we are continuing to make progress in the sunken garden and it is starting to feel like we have turned a corner. 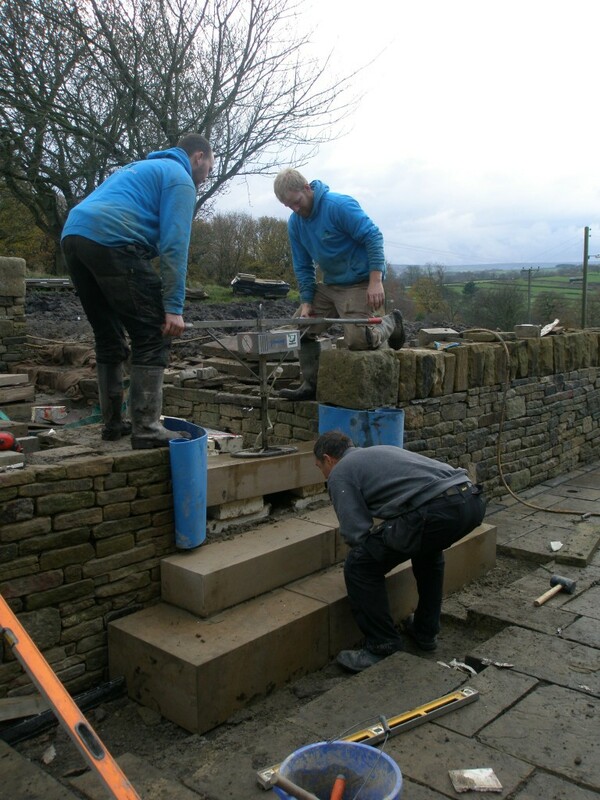 The main thing that is holding us up now is the delivery of the stone steps from the quarry. This was meant to take 4-5 weeks, but we are now on week 6. I am guessing that by the middle of next week that we may run out of things to do if the stone doesn’t arrive. 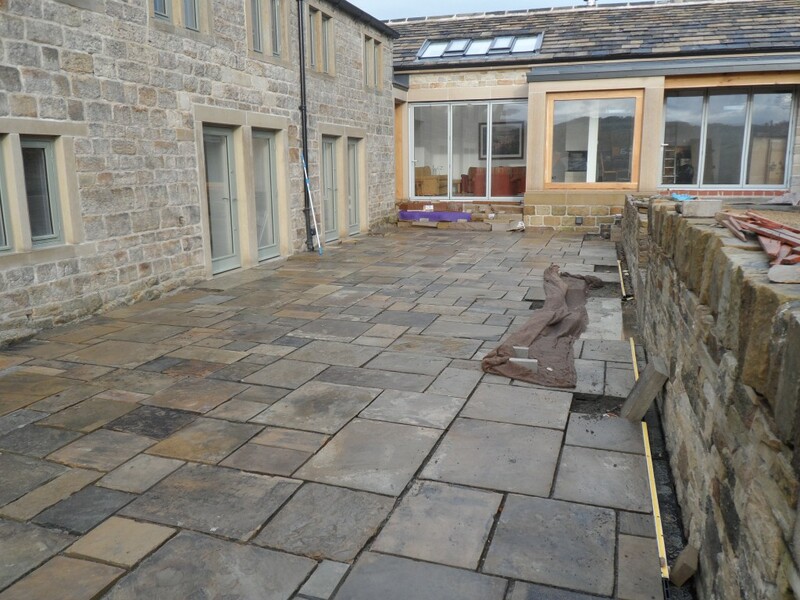 The last of the has been completed so that the flagstones can be laid on the upper terrace. This small wall can’t be seen (it is under the hessian) as it is being protected from the wet weather that we have had today. We have also had the holes drilled to take the lights in both the lower and upper terraces. The wall that we have built today is hidden under the hessian. There is still some work to be done on the other side of the wall, but that will have to wait until tomorrow. Hopefully, the weather will be a little bit better! Or rather drier! 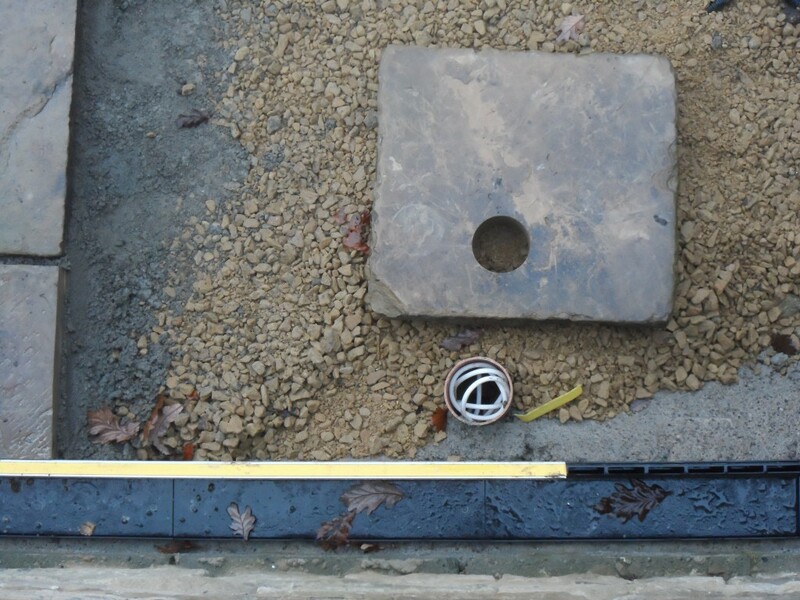 A view from above showing one of the 92mm holes that have drilled in the flagstones to take the lights. The wires were laid a few weeks ago before we put down the crushed stone. We worked out that these lights need to be about 300mm away from the wall to create the best effect. There was a small area, just behind the smaller of the front gates, that needed to be flagged. This was completed this week. 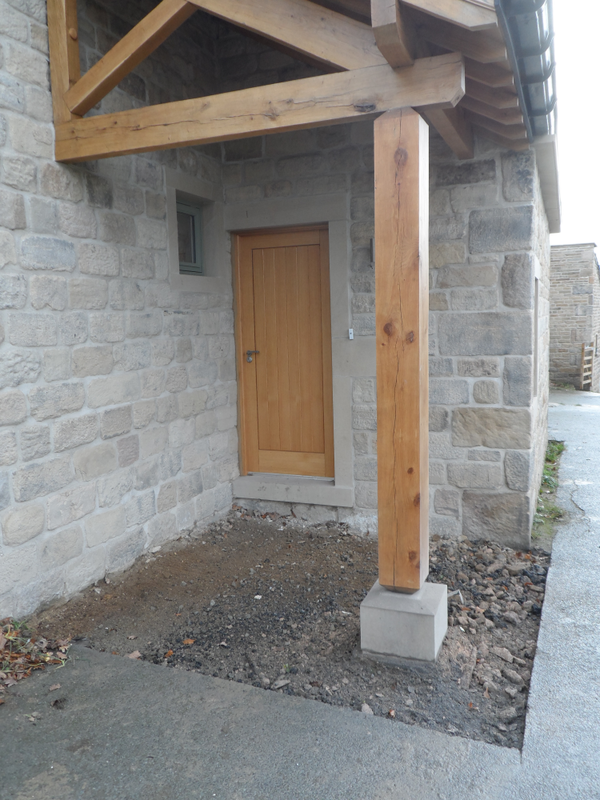 As well as sorting out the flagstones to the rear of the property we have also sorted out the flagstones under the porch canopy. 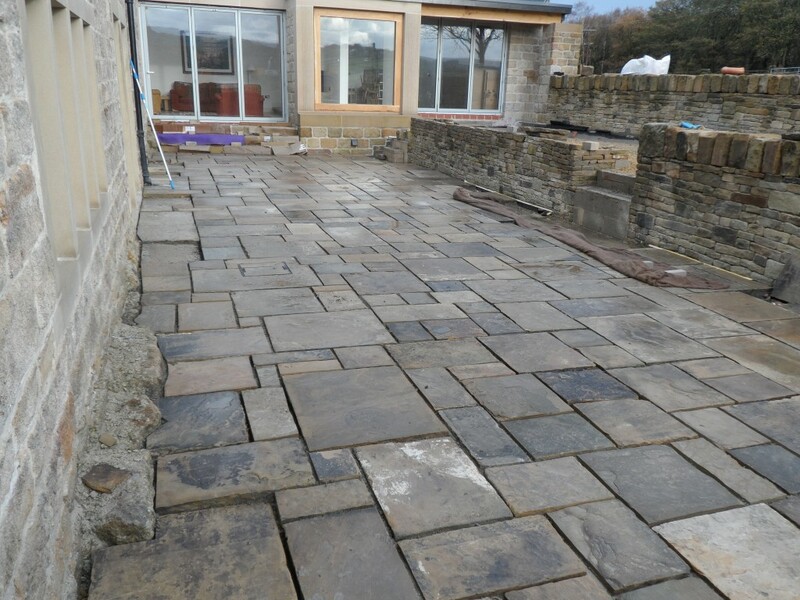 They still need to be pointed, but the pointing will be done when all of the flagstones – front and back – have been laid. With the lower terrace now flagged, our attention has moved to the upper terrace. This is considerably smaller, so will not take nearly as much time to get done. Two days in and probably 60-70% of the upper terrace has been flagged. Tomorrow the holes are going to be drilled for the lights to be installed in the garden. While these are being drilled, Paddy and Jonny are going to flag the area under the front porch. We will see considerable progress by the end of the week. The upper terrace is significantly smaller than the lower terrace hence progress has been that bit quicker. 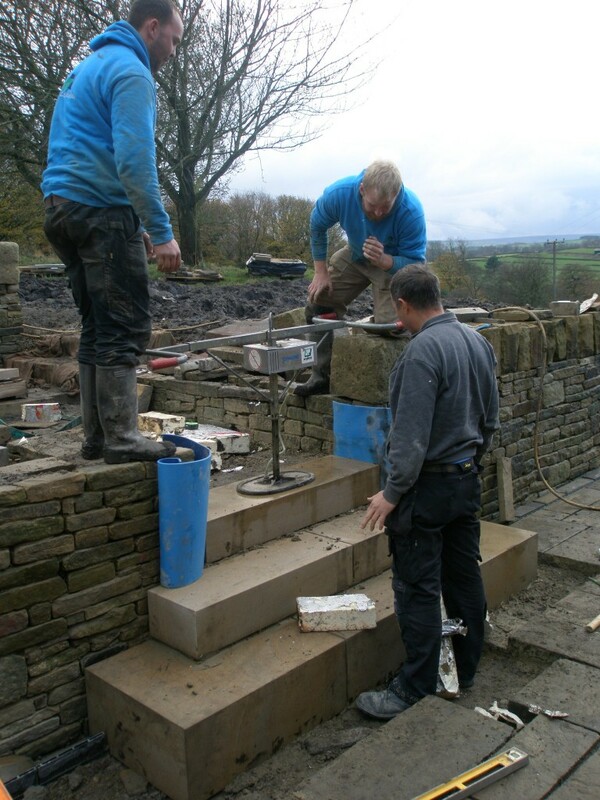 We will not be able to finish this area though until the stone arrives for the ashlar steps. It could be another couple of weeks before that arrives. 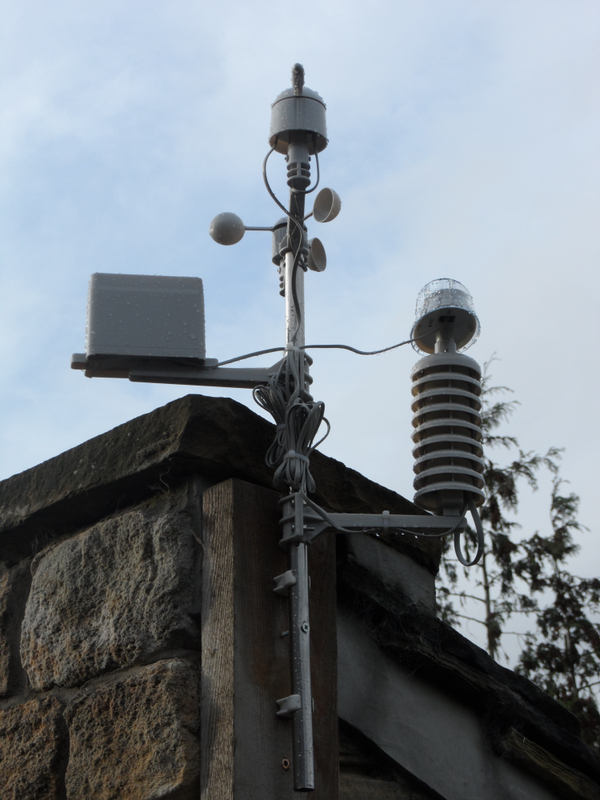 After the demise of our last weather station last week, we have installed a new one. It is remarkable similar to our previous weather station, however, this does have a solar meter which measures daylight. Our previous weatherstation was a Weathereye-WEA22. The new one is a Aercus WS3083. This one simply plugged into the same PC (via USB) as the old station and it worked. I had to tell it that it now had a Solar meter, but that was about the only change. The data is uploaded to the website every 15 minutes and you can access the page from here: http://www.haggleysfarm.co.uk/weather. It looks very similar to the old one, except this one is well screwed onto the shed. Although it is a different make, the outdoor attachments are identical (except this unit has a solar meter). It simply plugged into the PC and started uploading data. It took no more than 60 minutes to assemble and set up. This blog entry covers the Loxone kit that has been installed in the newer part of the property. You will find a separate blog entry here for the Loxone kit in the older part of the house. The main distribution board for the property is on the left. The electricity meter is just on the other side of this wall. 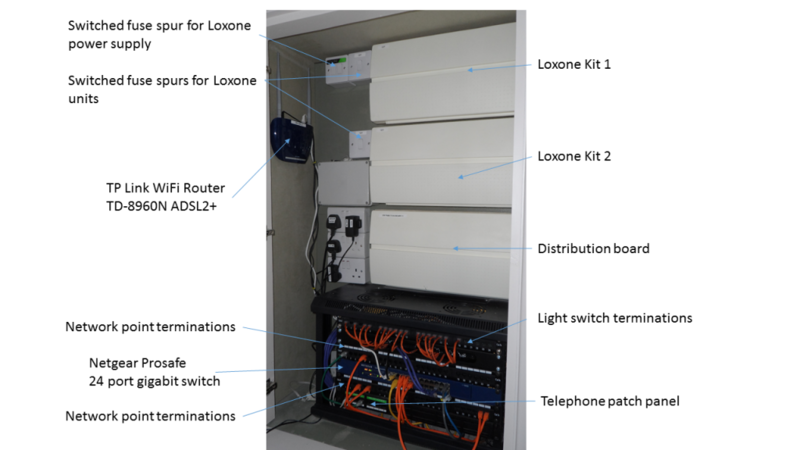 The three distribution boxes house the Loxone kit. These are the same Hagar units that we used in the other part of the house. The top distribution board has a Loxone Relay extension in it. This has no switch inputs, but has a number of switched outputs. This is required as there are so many lighting circuits in this part of the house (the kitchen alone has 7 lighting circuits). The next module is an 8V 1A Friedland door bell transformer which is used to operate the door latch release on the back door. This is activated using a key fob, fob reader and One Wire Loxone extender. Although the Loxone Extension units can output 10V, there is not enough current to operate a door latch. Lastly, in this top distribution board, there are a number of breakers that would not fit into the main distribution board. 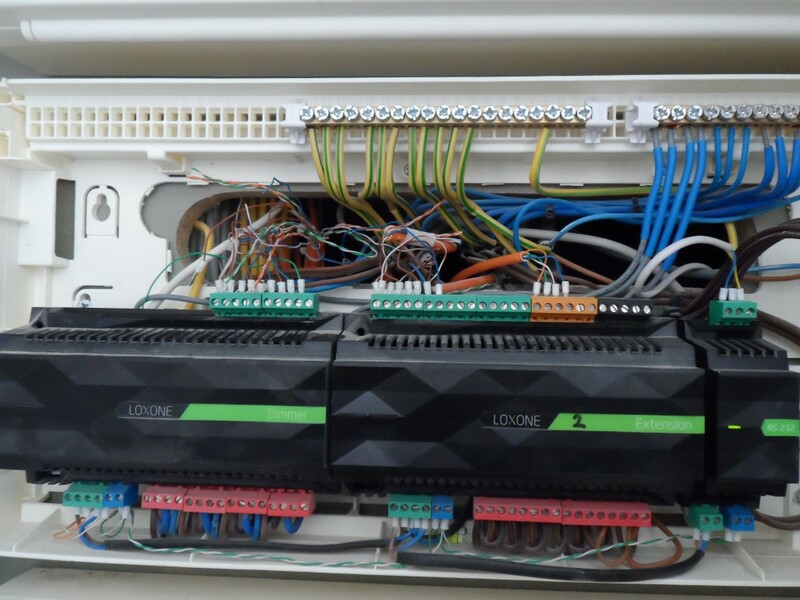 The middle distribution board houses the TDK 24v power supply for the Loxone kit, a single Loxone Extension and a Loxone Dimmer. The dimmer will centrally dim up to 4 separate lighting circuits. The bottom distribution board houses another 2 Loxone Extensions as well as a DMX controller and a One Wire Extension. At the very top of the unit, is the receiver for the Owl Intuition smart meter. This connects wirelessly to the transmitter on the other side of the wall (connected to the electric meter) and is this connect to the Internet via out network. This posts up data on our electricity usage every 15-20 seconds. You will find more about this here or on the Owl Intuition website. This shows the layout of the Loxone kit in the newer part of the property. It houses 3 Loxone extensions, a ,dimmer unit, a DMX extension and One Wire extension. There is also the receiver for the Owl Intuition smart monitor (the transmitter for this is on the external side of this wall attached to our electricity meter). Ever since we moved in, there has been a pallet for a step underneath the canopy by the front door. Fingers crossed, we will get this flagged next week – particularly if the weather is bad as this spot is somewhat sheltered from the elements. It was getting to a point where we had got used to the pallet! Time for a change. The old tarmac has now been taken up ready for the flagstones to be laid. 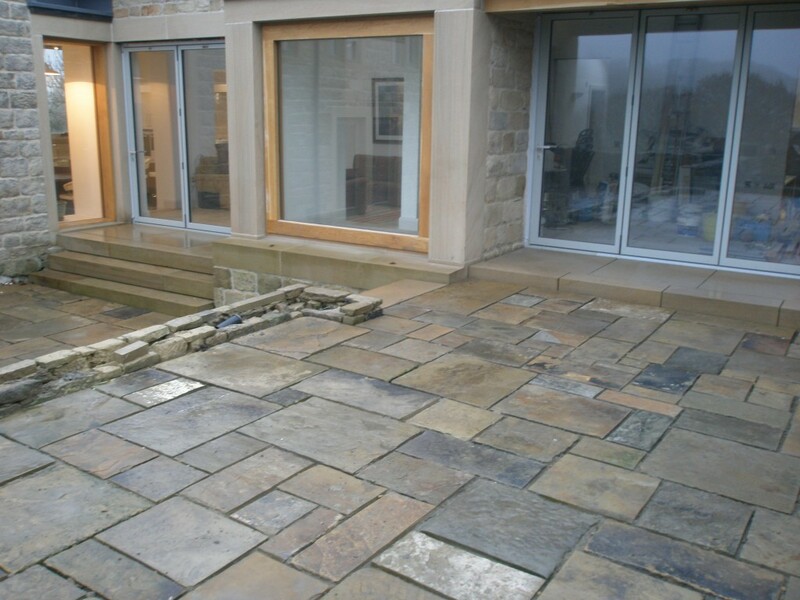 Now we have the flagstones laid in the lower part of the sunken garden, we have started to realise how nice it looks! 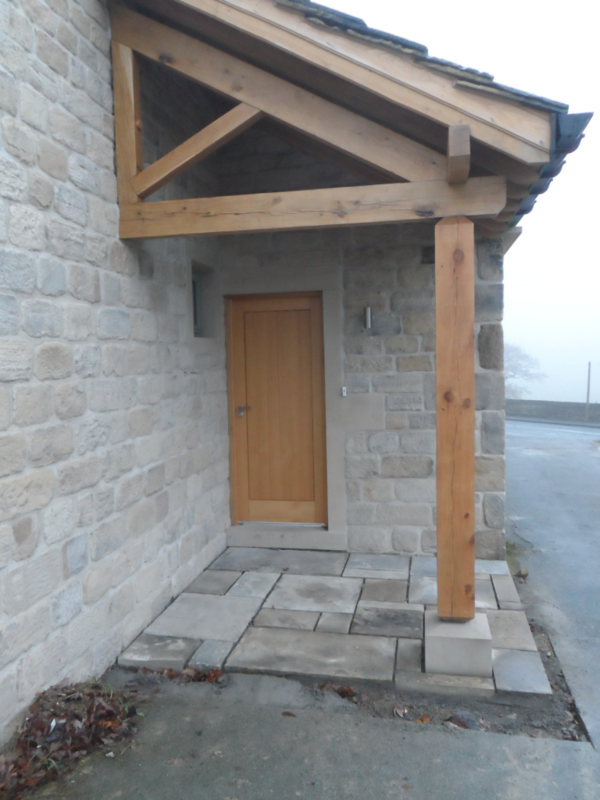 We thought it was about time that we sorted out the porch at the front of the property. The flagstones will be laid some time next week, but the area has already been prepped. Since this area is out of the worst of the weather, Paddy and Jonny may keep this piece of work in case the weather turns really bad next week! 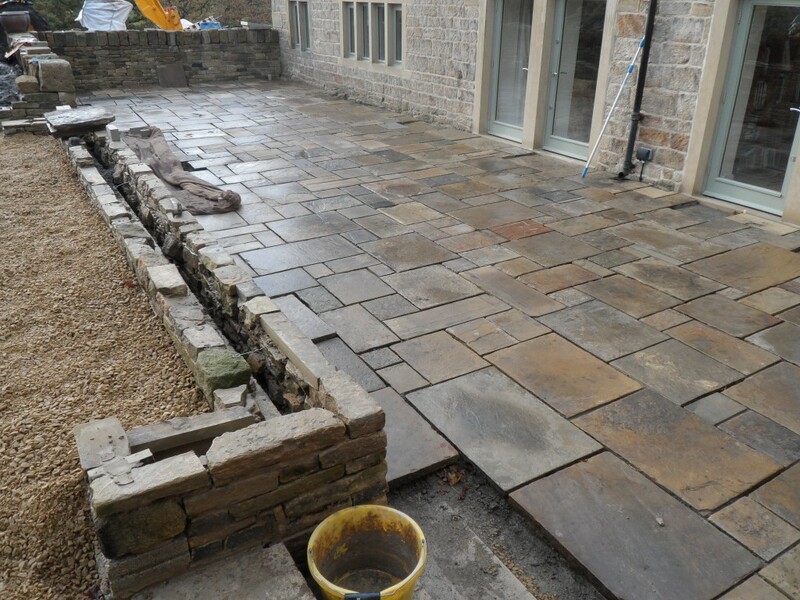 The majority of the flagstones have been laid in the lower terrace. They still need to be pointed as well as the holes drilled for the lights and the ashlar steps installed. 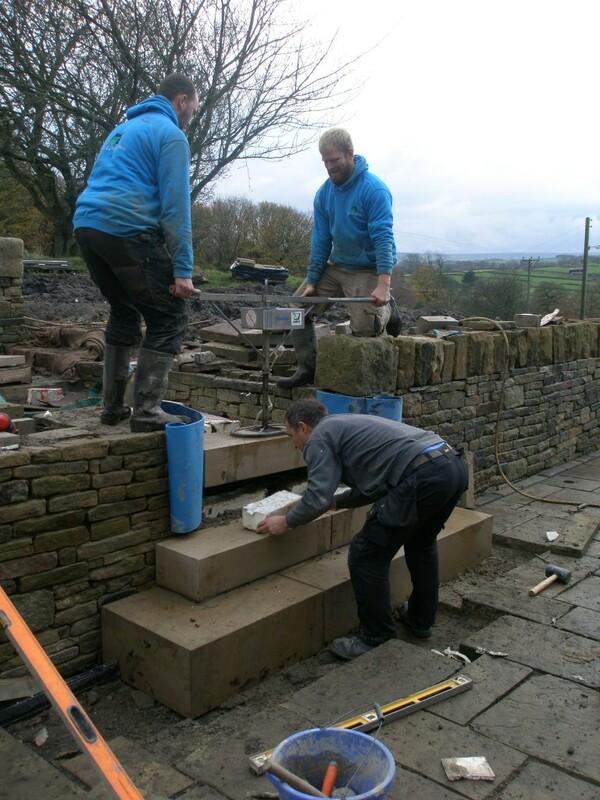 Things are being held up a little bit by the weather as well as the availability of the stone steps (the local quarry is very busy!). 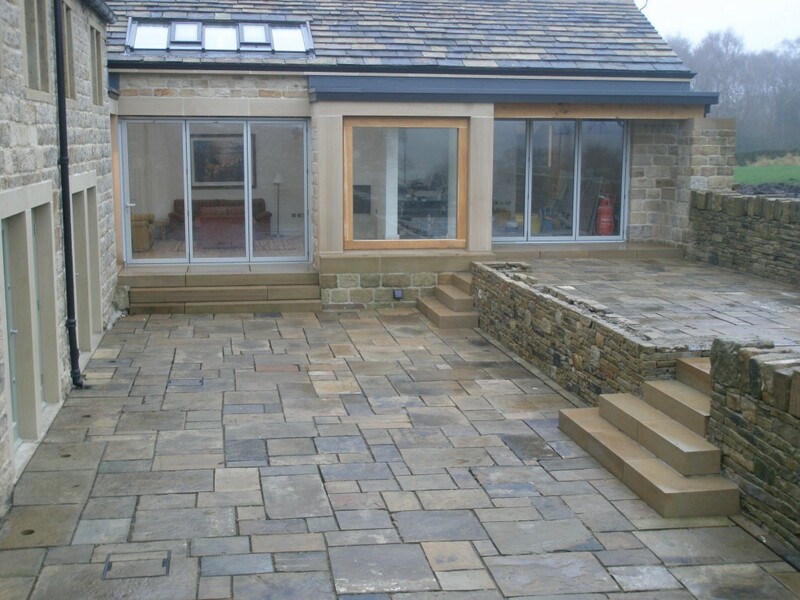 The flagstones gently slop away from the house and any rainwater is connected by a drain that runs along the back of this area (you can just see the slot (protected by a yellow strip) to camera right). There are a couple of flagstones that are propped up against the wall. These need to be drilled to take the uplighters that will be installed later. 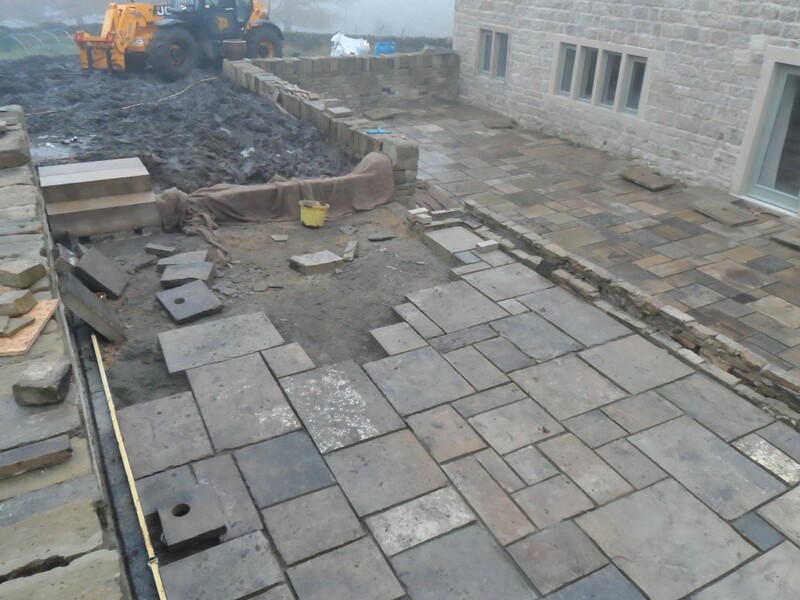 The flagstones have now been laid in the lower terrace in the sunken garden. The holes for the uplighters will be drilled next week and we should then be able to get all the flags laid in this area. We are going to use a special epoxy compound for the pointing, but this will be done when all of the flags have been laid. A couple of people have asked what the Loxone installation actually looks like and I realised that I hadn’t posted any photos since the installation had been completed. The Loxone kit operates as two “stars” that are linked together. One of the stars is in the older part of the building and one of the stars is in the new extension. The main electricity feed comes into the new part of the building, but this then feeds a distribution board in the older part of the building. While it sounds complex, it is actually straightforward. To make things a little easier to understand, I will go through the set up of each of the node separately. Let’s start with the node in the older part of the property. You will find Part 2 of this subject here that covers the newer part of the house. The Loxone kit is house in two Hagar cabinets. While they are a little expensive, they fitted in the space that I had and will comply with building and electrical regulations. The top unit houses a TDK 24v supply, the Loxone miniserver and an extension. The bottom unit houses another extension, a dimmer unit and an RS-232 module (to connect to the burglar alarm). The TDK power supply is feed by a switched fuse spur and the power to the Loxone kit is fed by two further switched fuse spurs. This means that all the Loxone kit can be power up, but the 240v power supplied to the mini-server, extension units and dimmer can be switched off separately. We are using Cat5 cabling for all of the light switches. All of the cables from the light switches terminate in a Cat5 patch panel. It is then a simple case of making up a “fly lead” to go from the patch panel and connect it to the relevant Loxone unit. The cable at the light switch is terminated using a standard RJ-45 plug. This means that it is a straight connection from the plug at the light switch through to the patch panel. This makes it very easy to test and also means that we can easily change the switches at a later date by just making up a new fly lead to connect to the Loxone kit. All of the network connections are terminated in one of two patch panels. There is one on top and one below the Netgear switch. The TP link router connects to the switch and then patch leads are used to connect the relevant network ports to the Netgear switch. We are using Schneider switches through the property and the stainless steel covers are a push fit. If you lift the plate off, there is a label on the inside that indicates which port in the patch panel it connects to. There is a telephone panel underneath. This takes the incoming telephone line and splits it into 4 outgoing RJ-45 connections. It is a simple task to connect a network port in one of the rooms to a spare telephone port. You need an adapter at the telephone end to convert the Rj-45 socket into something you can plug a UK telephone into. This makes it very easy to more the telephone points around. 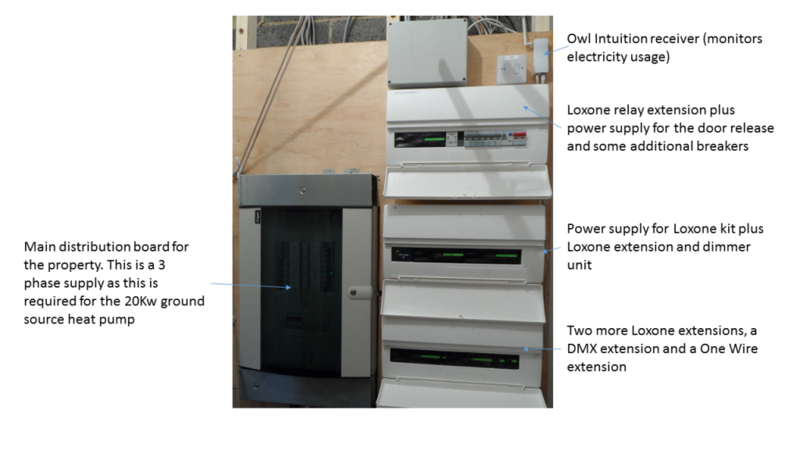 This shows the 3 distribution boards that house the Loxone kit and the RCDs for the older part of the house. The datacomm cabinet at the bottom houses the patch panels, network switch and telephone distribution panel. With the covers removed, you can see how the Loxone it is wired up. All of the low voltage connections have crimped ferrules attached; this makes it much easier to get good, reliable connections. This is the lower of the two distribution boards that holds Loxone kit for this part of the house.